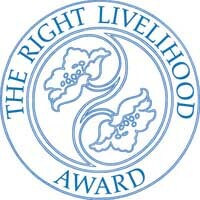 Efforts to promote peace, biodiversity and renewable energy helped activists from Sri Lanka, Kenya, Canada and Bangladesh win the 2007 Right Livelihood Award, also known as the "alternative Nobel," on Tuesday. The winners share the 2 million kronor (EUR218,000; US$310,000) award, founded by a Swedish-German philanthropist to recognize work he felt was being ignored by the prestigious Nobel Prizes. Nonprofit company Grameen Shakti was honored for its work to promote solar energy among rural households in Bangladesh. Sri Lankan legal scholar Christopher Weermantry, a former vice president of the International Court of Justice, was cited for his efforts to "strengthen and expand the rule of international law," the award citation said. The prize also honored Dekha Ibrahim Abdi, a Muslim peace activist from Kenya, for her work to bridge religious and cultural differences, and Canadian farmers Percy and Louise Schmeiser for defending biodiversity and farmers' rights. The couple has been embroiled in a legal battle with U.S. agribusiness giant Monsanto Co. over the use of the company's genetically engineered canola plant. Prize founder Jakob von Uexkull said Abdi and Weeramantry "demonstrate how war and terror can be overcome by peace-building and the rule of international law," while "the Schmeisers and Grameen Shakti show us how to protect two essential services of our global ecosystem: our agricultural resources and our global climate."